NZHRA thanks those people who have put their name forward to be on the NZHRA Rodders Help List. NZHRA thanks those companies who support us and encourage our members to support them! New Zealand Hot Rod Association Inc Members receive a discount* off the $199 Recommended Retail Price when ordering the New Zealand Car Construction Manual (Read more about the CCM here). *Does not include postage fee. We are Hot Rod owners and enthusiasts, so you get a level of care and understanding from us that you won’t get from other insurers. We ‘get it’ when it comes to Hot Rods. We share your passion and are proud to support NZHRA and many events throughout the country – see you out there! Want to save money on your fuel bill? NZHRA Members can receive up to 10 cents off per litre on Fuel! NZHRA has signed an agreement with GOfuel, which entitles all NZHRA Affiliated Members to some serious fuel discounts. There are 3 different ‘NO FEES’ fuel cards available giving Members a choice of where they would like to fill up. I'm interested but I have a few questions? Click here for more on the deal above! Quick and simple click here to complete your application form. Click here. • All bookings are fully flexible; there are NO penalties for altering sail dates and times. This means you can book in advance, making the most of early booking rates. • Payment is not required until check in and payment is made directly to Interislander. • A special booking web page has been created to make booking your trip or getting a quote even easier. On occasion promotions will be offered on this site. How do I take advantage of this deal? You will need to book your crossing with Tony Hirst our independant boking agent. DO NOT BOOK DIRECT WITH INTERISLANDER PLEASE. Or visit www.cookstraitcrossings.co.nz click on BOOK OR GET A QUOTE or on the CONTACT tab. Fill in the form to the left of the page with what you are after. Make sure you note NZHRA followed by your affiliation number in the WHAT MOTOR SPORT EVENT ARE YOU AND YOUR TEAM COMPETEING IN section, so that Tony knows you are a NZHRA Member and can give you the correct discount. Please ensure you tell the staff at BNT that you are an affiliated NZHRA Member and to use the account 'HOT ROD'. You will need to provide your Membership number and show them your Affiliation Card in order to take advantage of the offer. 30% Discount off standard rates on your Hot Rod Insurance + multi vehicle discounts. This special includes all of the usual Classic Cover Insurance features such as: your choice of repairer, salvage rights remain with you, Glass cover on all glass including head and tail lights, expert claims assistance, personal service, plus many more benefits. All you have to do is call one of their friendly staff on 0800 456 254 to get a quote and arrange cover. Check them out on: www.classiccover.co.nz and see why they insure more hot rods, street rods, classics and race cars. Support the Insurer that supports your hobby. 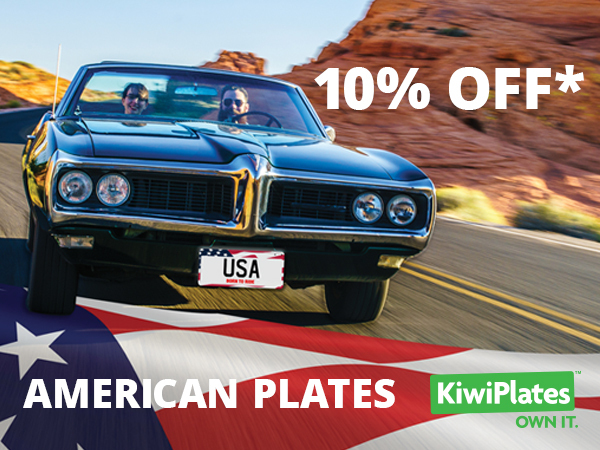 To celebrate the launch of American Plates, Kiwiplates are offering a 10% discount to NZHRA Members. Simply enter the code NZHRA2018 on checkout to save up to $107 at new American Plates. Get you plates now by clicking here or call 0800 650 111 to order. *Special offer is valid until 11:59pm on the 31st May 2018 and is only valid for the American Plate range. This offer is not valid in conjunction with any other offer and does not apply to Premium Plate formats, gift vouchers or Layby. All you need to do is either email or call our local Sales Support Team! We can provide you with a quote using the best deal available for your dates of travel less the special 15% discount!!! Click here to download their informative PDF. Fare discounts do not apply to taxes. This special offer is only available to NZHRA Members and their immediate Family. A valid NZHRA Affiliation number must be provided at the time of booking. Contact the NZHRA Office for the code to use to receive the discount. Please ensure you have your Member Number ready. Please click here to contact Famous Pacific Shipping directly. Ensure you say that you are a NZHRA Affiliated Member and have your member number handy in order to take advantage of the special. Want to receive the Fender Flyer via Email? New Zealand Hot Rod Association Inc Members receive the NZHRA Fender Flyer via email when registering their email address with the NZHRA Office. (Current members update your details here). The Fender Flyer is a 6+ page pdf document which contains Coming Events, NZHRA Club Profile, NZHRA Club Member Vehicle Profile and news regarding the Association.